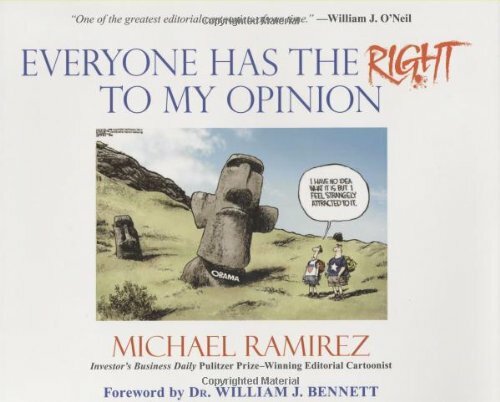 Michael Ramirez (wiki) won the Pulitzer for editorial cartooning last year 2008, as well as in 2004. So yes, his cartoons are amazing, with a few in this book choking me with laughter. There's incredible detail in the drawings and settings, drawing readers in before giving the punchline in full satisfaction. Everyone has the right to my opinion contains mainly cartoons published after 2000. There's also a collection of his award winning cartoons from 1994. Do check out his online cartoon gallery on investors.com also.